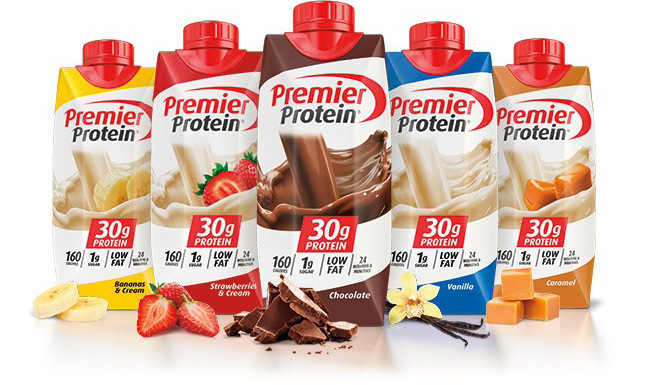 Help your clients meet their protein needs easily with Premier Protein! Subject: Help your clients meet their protein needs easily with Premier Protein! Thank you for your continued support of Today's Dietitian. Below is information from one of our sponsors. Thanks for visiting us at the Today's Dietitian Spring Symposium! Premier Protein would like to thank all Today’s Dietitian Spring Symposium attendees for visiting our booth. We hope you enjoyed sampling our products and learning more about our brand. For those we didn’t get a chance to meet, please visit www.PremierProtein.com to learn more about our brand or read on for a brief description of our product lines. Packed with 30g of protein, 160 calories, and only 1g of sugar, Premier Protein shakes give you the good energy you need every day. They are ideal for breakfast on-the-go, an afternoon snack, or a post-workout boost. Available in five flavors: Chocolate, Vanilla, Strawberries & Cream, Bananas & Cream, and Caramel. 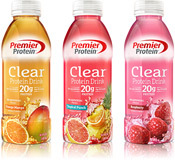 Delicious and refreshing, Premier Protein CLEAR® is packed with the protein your body needs without all the sugar and calories you don’t. With 20g of protein, 90 calories, 0g sugar, and no artificial flavors, Clear Protein Drinks are a refreshing boost of good energy any time of the day. Available in three flavors: Tropical Punch, Orange Mango, & Raspberry. 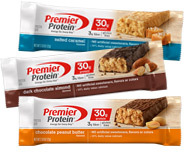 Premier Protein’s 30g bars are available in seven delicious flavors. Each bar is packed with 30g of protein & 3g of fiber, provides 10% daily value of calcium, and contains no artificial sweeteners, colors, or flavors. Whether you’re grabbing breakfast on-the-go or in need of an afternoon snack, these delicious bars help curb hunger and fuel all-day long energy. 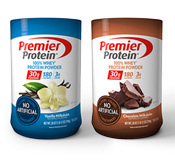 Premier Protein whey protein powders are available in two delicious flavors — Chocolate and Vanilla. Each powder uses 100% whey protein as its protein source, is gluten free and has no artificial sweeteners, colors, or flavors. Packed with 30g of protein, 180 calories, and 2g sugar per scoop, Premier Protein whey powder is perfect for shakes, smoothies, and cooking. Visit www.PremierProtein.com to learn more about our products. Sign up for the Premier Protein Health Professional Sampling Program. COPYRIGHT 2017 PREMIER NUTRITION CORPORATION. ALL RIGHTS RESERVED.